A Healthy Dose of Autism Awareness – Do you speak Autism? Just in case I had forgotten to mention it, April marks World Autism Awareness month. One of my favourite Autism bloggers, Autism with a Side of Fries, posed the question on Facebook: What would you like everyone to be aware of when it comes to Autism? An excellent question and one which I think merits an update to this blog. There are so many topics I have covered since I began writing. Schooling, Sensory issues and behaviour, travel, toilet training to mention a few. But one that I haven’t covered is illness, which is ironic, because in answer to MamaFry’s question, if I had to raise awareness of Autism in one area, this would be it. Luckily, because James is normally fit and well, it hasn’t been an issue very often. This week, however, James has been suffering with flu and it has brought it home to me how much more difficult illness is for someone with impaired communication and difficulty processing feelings. It’s always a worry when James gets ill, because a) he can’t tell us what feels wrong, and b) he tries to fight it, which can make illness harder to spot. He struggles to interpret the signals his body is sending him and adapt his behaviour accordingly. I suppose this is all part and parcel of his reliance on routine – which is, of course, the first thing to go out the window when you are ill. Ultimately we are alerted to his illness through its physical manifestations i.e. a temperature, loss of appetite, or sickness. Even with these symptoms, he attempts to carry on as normal. It’s very hard as a parent having to refuse your child his beloved warm milk because you know it will make him sick again, but have no way to explain that to him. Meltdowns inevitably ensue because nothing is as it should be. Last year, one of James’ teeth became infected. Unbeknown to us, he must have at some point bashed it and his tooth had died, leaving a cavity where a live root should have been which made it prone to infection. Although it was a little discoloured, it had never appeared to bother him. We realised things were not right one day when he became listless and feverish, but nothing about his symptoms gave us any clues that the issue was with his tooth. It was only when his gum and upper lip began to swell that I twigged – and I felt so guilty. He must have been in so much pain, and I hadn’t realised. I’d just assumed he had a bit of a virus and given him calpol. One thing you can always bank on when James is ill is that it will be a weekend or a bank holiday. Not wanting to take a chance, we took him to the out-of-hours surgery where unfortunately, we were seen by a rather young and inexperienced GP. Something I have found about healthcare professionals is that their understanding of autism is about as hit-and-miss as the general population, which I do find shocking considering their level of education and the responsibility they hold. The doctor seemed alarmed that James would not allow her near enough to examine him, and even though I had managed to take a picture of his tooth and gum, she was clearly not confident dealing with a case where she wasn’t presented with a typical patient. Her initial response was to try to pass the buck by contacting an emergency dentist, but it turns out you have about as much chance of seeing one of those as sprouting an entirely new set of teeth. Ultimately we were fobbed off with ‘keep giving Calpol and plenty of fluids’ when actually a course of antibiotics was what was required. I believe this doctor panicked and decided the best course of action was to get us to wait until the next day when it would become someone else’s’ problem. 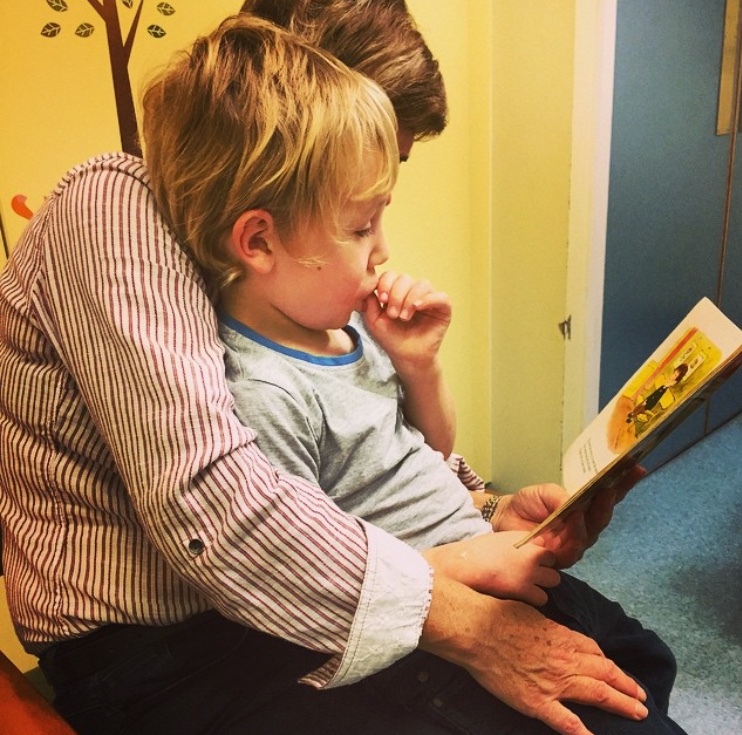 Actually, waiting is a bit of a theme when it comes to seeing a healthcare professional, which is a total nightmare when you have a child with autism. James doesn’t do waiting, or sitting still for that matter, so the inevitable twenty minute delay in the doctors’ waiting room is something I utterly dread. Having a roomful of generally elderly, sick people tutting while I attempt to handle a screaming child who is hell bent on running back and forth through the automatic doors is not fun. At risk of this post turning into a rant, I should sum up with the key things I would like society (and healthcare professionals in particular) to be aware of about Autism and illness. A person with Autism may not be able to able to explain what is wrong, so it is necessary to be a detective, look for clues in behaviour and consider all possibilities. Visuals can be helpful for some, eg Makaton signs for ‘pain’ or a diagram of the human body which can be used to point out the source of pain or discomfort. Being examined or touched by a stranger (or even a person they are close to) can be deeply distressing for a person with Autism. It’s important to listen to and involve parents/carers on how to best manage this situation. Illness for people with ASD may be particularly difficult because of the disruption caused to normal routine, and because they may have difficulty interpreting/ processing physical feelings. Sensory issues can mean a person with ASD may feel pain very acutely or hardly feel pain at all. I may update this as I think of extra points – feel free to comment if you have any tips or recommendations of your own. 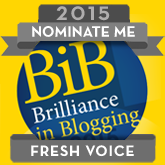 psst..The Brilliance in Blogging (BIB) awards 2015 are currently in the nomination phase and I would be super, super grateful if you lovely people could nominate me in the Fresh Voices category. It only takes a couple of minutes to fill out the nomination form which can be found here. Thank you! This entry was posted in Autism, Disability, illness and tagged #antibiotics, #autism #parent #understanding #autismawareness, #calpol, #communication, #dental, #feelings, #healthcare, #illness, #infection, #medical, #meltdowns, #routine, #sensory, #sickness, #teeth, #visualprompts. Bookmark the permalink. My extra point would be for doctors not to use facial expressions as a guide to how the patient feels. My sons rarely give the appropriate facial expressions in response to pain or illness. My boys tend to laugh and smile when the doctors are pressing on areas that should be sore. Infact I once had to insist that an a&e doctor exray my eldest sons toe, she didn’t want to because there was no swelling and he seemed fine (he was smiling) only to discover on the X-ray that it was broken. That’s a really good point – thank you !